The Iron Man Blu-ray release sports one of the best overall presentations from the Marvel film universe, as our Marvel Avengers Month marches on! Contrary to popular belief, there was a time when financial success, critical acclaim, and comic book movies were simply not in tandem. Superman I & II, once considered instant icons of their time, faded from public concern as two forgettable sequels were released that effectively killed the franchise until 2006’s equally-disappointing Superman Returns. The Tim Burton Batman franchise soon repeated Superman’s mistakes; after Batman and Robin, I’m sure fans of these timeless characters wept bitter tears as any hope of more films faded quickly and quietly. Marvel hadn't fared much better: their release of Hulk in 2003 was both a critical and financial disappointment. So once again, fans lamented over what could have been. But then, something happened in 2008 which turned everything around: in a single summer, DC and Marvel rebooted themselves with Batman Begins and Iron Man respectively. These were a return to good old fashioned action films with great stories, relatable characters being placed in situations in which we genuinely followed their movements. With Iron Man, it seemed that Marvel finally got it right, throwing off the burden of Hulk by creating their own content and therefore controlling its own destiny. 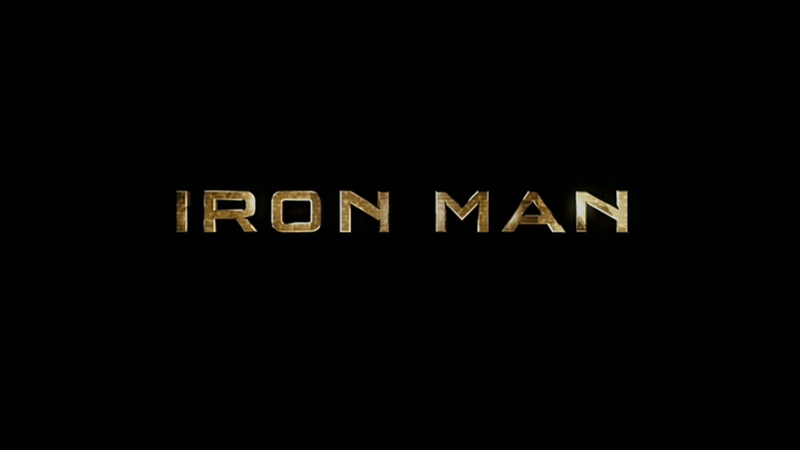 Iron Man is that special film which comes along once in a generation: it re-defined an entire genre, provided a solid road map for future films, included a terrific collection of cameos, hidden Easter eggs and various tips-of-the-hat. In a year that saw few good films, Iron Man stood far above most, reinvigorated comic books, and demonstrated that a hero could exist in a universe filled with them. The Blu-ray release of the Ultimate Edition is simply the best of 2008, with an impressive transfer and the best collection of supplements I’ve seen in awhile. Tony Stark (Robery Downey Jr, Sherlock Holmes) is a billionaire genius who has followed in his father’s footsteps as the world’s most successful weapons developer. His success affords him a life most of us could only dream of: fast cars and women, private jumbo jets, and all-night parties. He’s so successful that even a test-launch of his new Jericho missile in Afghanistan is merely brushed aside: “To peace!” he says as he takes a drink from the dry-ice tray which rises from a cargo box. All of that comes crashing down after his caravan is attacked, killing most of his protection detail and leaving Stark with mortal injuries. 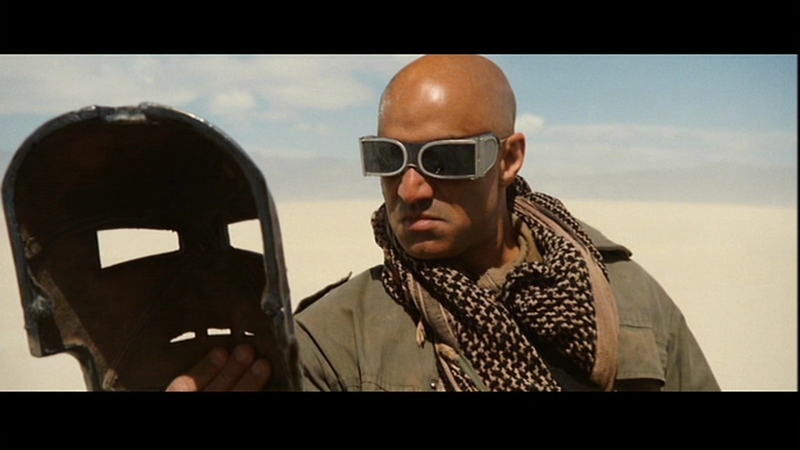 Soon, he learns that the weapons used to target him were of his own creation, sold on the black market to an Al Qaeda-like organization who demands Stark build them a second Jericho. 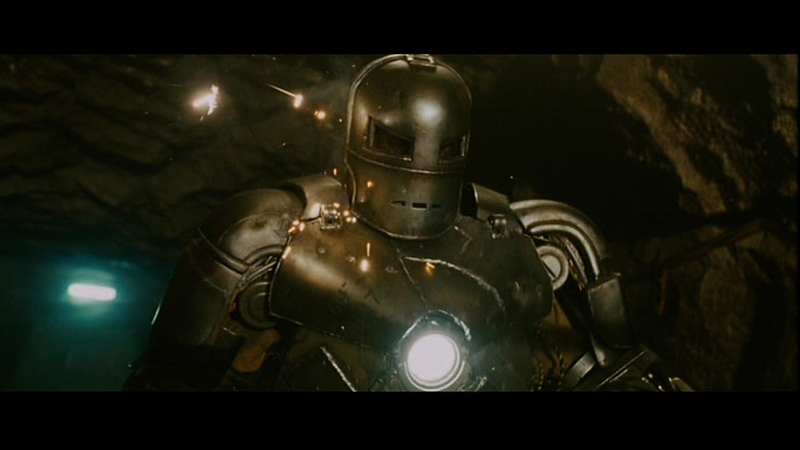 But Stark has a plan, and builds a giant flight suit made from missile parts; thus Iron Man is born, and his escape from his captors is just the start of Stark’s journey to find out the person responsible for selling the weapons. Together with his assistant Pepper Potts (Gwenyth Paltrow, Seven) and James “Rhodie” Rhodes (Terrance Howard, Crash), Stark uncovers a secret which involves his mentor Obadiah Stane (Jeff Bridges, Tron). Downey was so made for this role, and his performance is simply perfect; few others could have repeated his effort, and director Jon Favreau (Swingers) lets Downey run wild here. He’s funny, self-deprecating, sexually available, and tough when the truth about Stark Industries is revealed to him. He’s a man’s hero, built from the ground up and full of swagger. Favreau doesn’t waste time with pretty shots, instead allowing the very strong script by Mark Fergus (Children of Men) to breathe. Fergus creates a nice triangle of characters who play off each other very well. 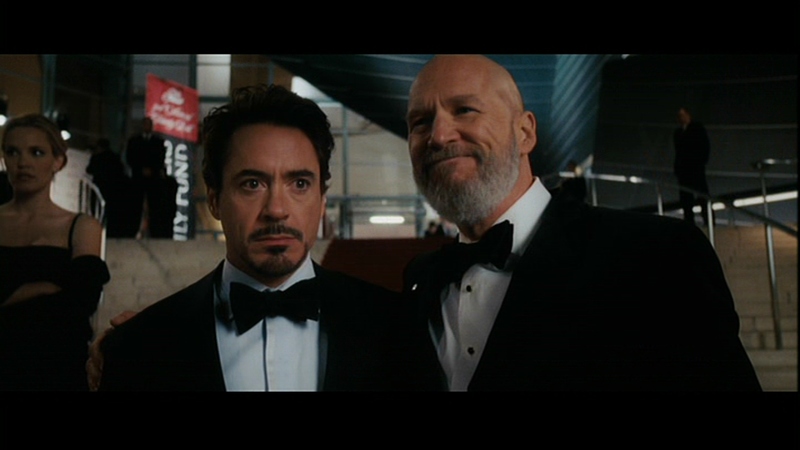 From the cameos (both human and manufactured), to the after-credits scene with Nick Fury, Iron Man is an old-fashioned, action-packed comic book movie with few if any errors. It’s an instant classic. 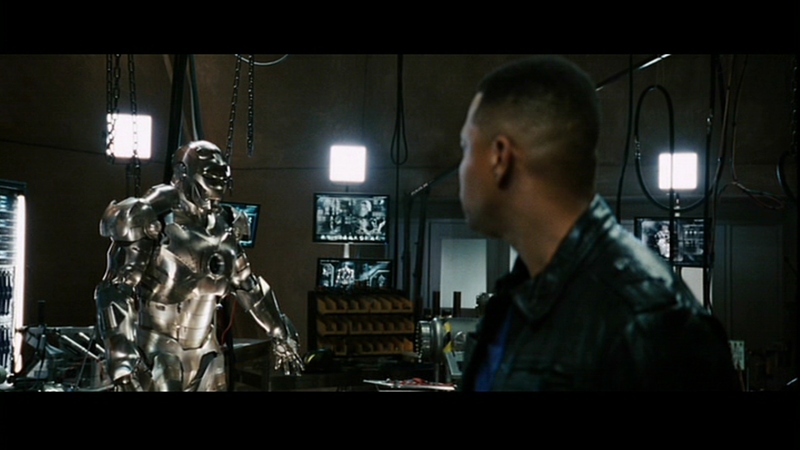 Iron Man is presented in an MPEG 4/AVC transfer that is as clean as any pre-digital age film I’ve seen. The transfer from the master print reveals zero evidence of edge enhancement, haloing, or pixilation while at the same time creating such clarity in skin, clothing, and amazing detail in Iron Man’s armor. The effort which ILM made in giving Iron Man and War Monger their wings is simply extraordinary, and the transfer shows off every ding and scratch in their respective armor. Flesh tones are realistic, giving the appearance of harshness in the desert terrain and softness in other scenes. Given these endorsements, I did notice some overexposure in the outdoor desert and cave scenes, and some between which is why the grade here suffered slightly. But those issues are few and far between. The transfer is nearly perfect. If video suffers at all, the audio track is simply amazing. 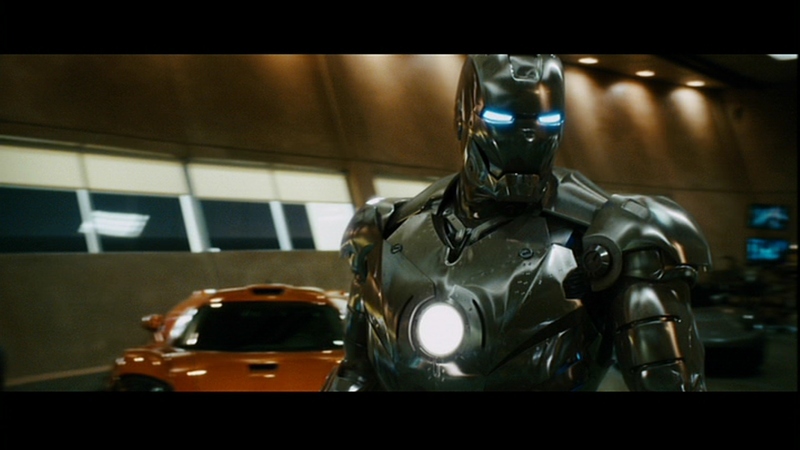 Iron Man is presented in TrueHD 5.1 Audio, which from a technical standpoint means you are getting as clear a sound from the studio as possible. It's much like the current popularly-utilized Master Audio codec, so you should not hear much difference between the two. Like Stark's Jericho, this lossless track is let off the chain often, producing a rich, immersive experience. Explosions, gun fire, machines and Iron Man's various accoutrements come out crystal clear, but also play nice with dialogue and music. Each has its place in the film, along with surround track which wraps the listener in crowd noises, air base chatter, war room conversation, and press corps questions. Ramid Djawadi’s high-flying soundtrack is terrific here, with a nice mix of symphonic pieces with rock anthems. It's a remarkable track and one of the best I've ever heard, considering the lossless audio was a new and misunderstood aspect of the Blu-ray experience. Hall of Armor: A really incredible interactive of the four Iron Man suits. You can perform a 360 degree view of each suit and spotlight various pieces of each armor. The Invincible Iron Man (49:00): This six-partner takes us through the evolution of Iron Man, from Stan Lee’s early comics to current editor A slew of current artists, from Warren Ellis, Tom Brevoort, John Romita Jr and Gene Colan, to writer Gerry Conway. If you’re looking for the definitive discussion of the character, look no further. It was interesting to learn about Iron Man’s appeal among 60’s women, as well as the emotional underpinnings of the character. The six parts are: "Origins" (8 minutes), "Friends & Foes" (4 minutes), "Definitive Iron Man" (5 minutes), "Demon in a Bottle" (2 minutes), "Extremis and Beyond" (26 minutes) and "Ultimate Iron Man" (4 minutes). Deleted/Extended Scenes (24:00): This set of deleted scenes does not alter the outcome of the movie, but are still interesting to watch. I Am Iron Man (108 minutes): This mammoth discussion takes the viewer through every aspect of the film's creation and is broken down into seven sections (The Journey Begins, The Suit that makes the Iron Man, The Walk of Destruction, Grounded In Reality, Beneath the Armor, It's All in the Details, and A Good Story, Well Told). Wired: The Visual Effects of Iron Man (27:00): Favreau and a host of ILM and visual effects people are featured as they discuss every element of the film's special effects. The Actor's Process (4:10): This scene rehearsal with Downey, Bridges, and Favreau is a fascinating featurette. The Onion "Wildly Popular Iron Man Trailer to be Adapted into Full Length Film" (2:39): A really funny gag segment which pokes fun at the film. Image Galleries: There's something like 90 still over 10 topics, including concept art which is sometimes as cool as the movie itself. A surprise and welcomed addition. Much like their toy line, several versions of Iron Man are offered. Among the most rare is a Steelbook that quickly disappeared from shelves and appeared on eBay for ridiculous sums. The copy I reviewed includes an embossed slipcover but no interior artwork or artbook. In addition to the varied covers, fans have discovered "Easter eggs," special features which are unlocked by either find or pressing a series of buttons on your remote. From the main menu of Disc 1, scroll down to BD-LIVE and press the Right arrow on the remote. A schematic of Iron Man's hand will appear; press Enter to see a funny interview with Stan Lee and Robert Downey, Jr. at the red carpet premiere. Iron Man reintroduced me to comic books with its quick wit, incredible action scenes, and some of the best tips-of-the-hat ever placed on film (who can forget Cap’s shield). The Blu-ray release is equally good, with a terrific transfer and some of the best supplements ever offered. Pick up this release, and enjoy it with the volume absolutely cranked up!